The holidays have finally passed and it seems like life is slowing down a bit. We have tried to stay busy over the break, but the cold, and I mean COLD weather outside makes it hard to want to go out and do anything! Anything but make soup that is. Over Thanksgiving I boiled down my turkey carcass for turkey stock and stored it in the freezer. I love having homemade stock. Store bought, even the "real" stocks aren't even comparable. I also had some turkey that I froze just to be used in soup. But there is a key to using meat already cooked in soups. It must be added last and not allowed to come to a boil. That makes meat chewy and tough. 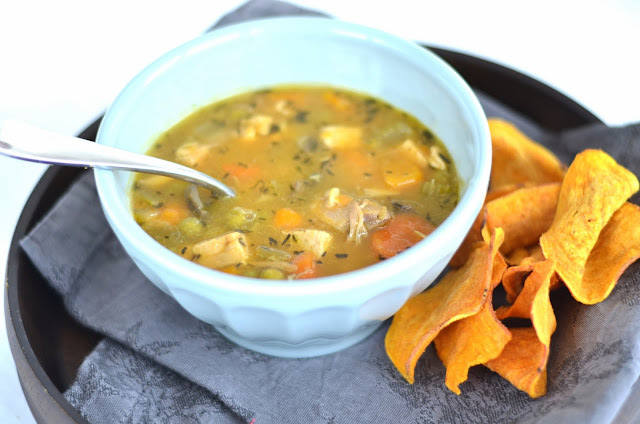 This soup is perfect for a blistery day and will warm you right up. In a large dutch oven, heat oil over medium temperature. Add the onions, carrot and celery and cook until the onion turns translucent, about 5 minutes. Add the squash, mushrooms and thyme. Cook so the mushrooms release moisture and then it starts to reabsorb, about 10 minutes. Add the peas, garlic and stock. Stir well. Bring to a boil then reduce heat to medium low and cover almost all the way. When the vegetables are tender, add the turkey, salt and pepper to taste. Cook over medium until the turkey is warmed.